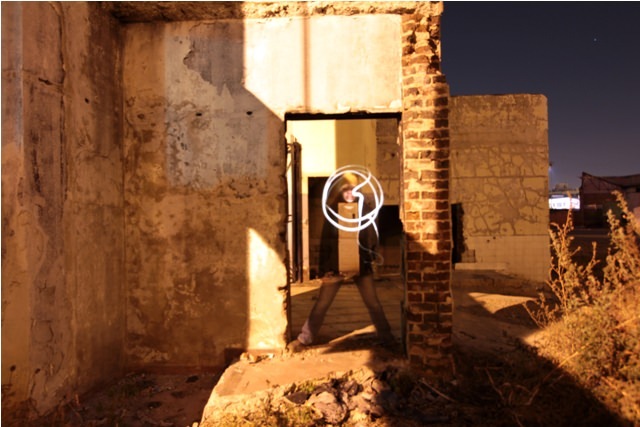 You may have noticed this already, but I get a lot of blog post ideas from my outings with the Joburg Photowalkers. Photowalking is a simple yet brilliant concept: A gang of people get together, walk places, and take pictures of stuff. It’s the perfect way to meet people, improve your photography, and go places you would never go alone with an expensive camera around your neck. 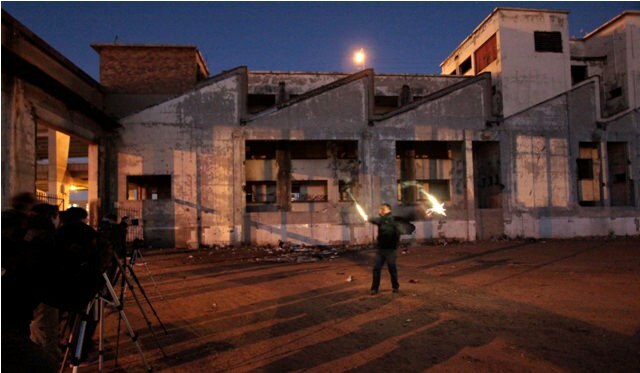 Most of the photowalks I’ve done have explored Joburg neighborhoods, like Hillbrow or Chinatown. But last weekend, instead of photographing a neighborhood, we photographed light. Artificial light that we literally painted onto a canvas of darkness. We gathered at sunset in the parking lot of the Sci-Bono centre in Newtown. The group headed across an empty field and under the M1 highway, to an industrial area filled with crumbling warehouses and garbage. 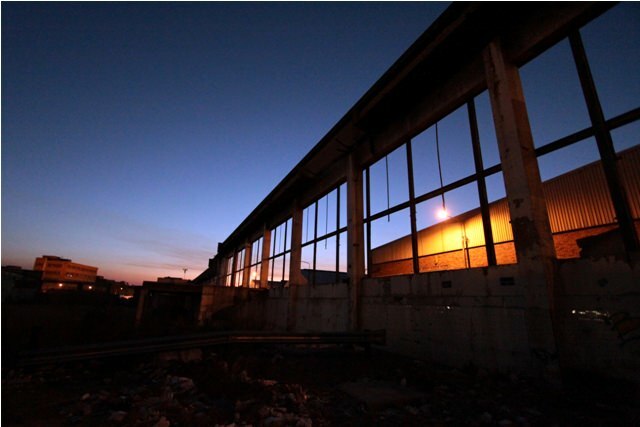 Our destination was a walled area the size of a couple of football fields, which Joe says is an abandoned bus depot. The remains of the bus depot. We arrived on location as darkness fell. Before I even had the chance to set up my brand-new tripod (a birthday present from Joe), people started illuminating their sparklers and light sticks and swinging them around. Shutters were clicking and everyone was oooh-ing and aaah-ing at their cameras’ LCD screens. I tentatively snapped a few frames. But my LCD screen didn’t show any light-painting, just people running around with lights. Still pretty cool, but not what I intended. 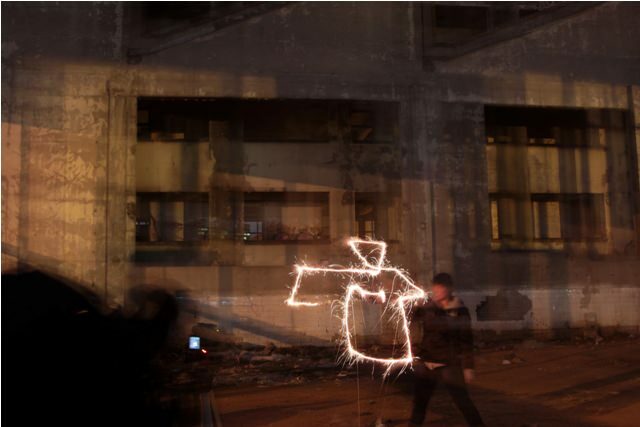 TP, the husband of legendary ex-pat blogger Bing, demonstrates Tai Chi with sparklers. I looked helplessly at my camera and started to panic. My dirty secret was exposed: I have a good eye but lousy camera skills. 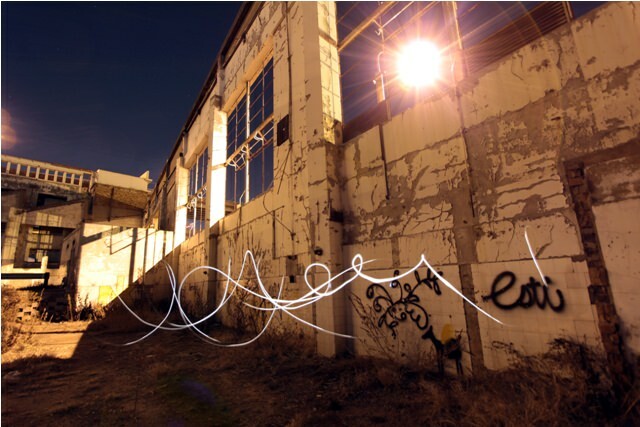 I needed a crash course in light-painting. With some help from Joe and my friend Lauren, I learned how to change my camera settings and adjust the shutter speed. Then the real fun began. 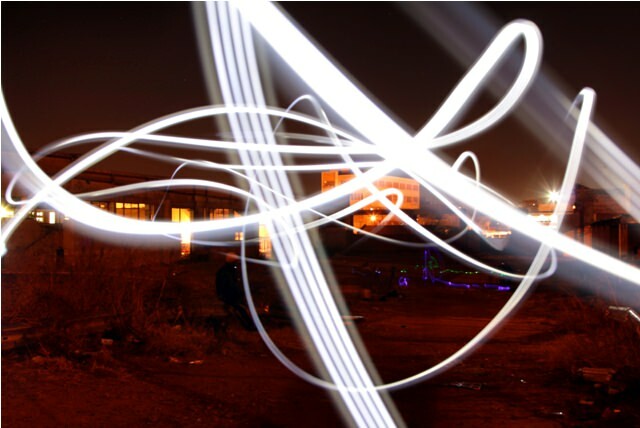 One of my first light paintings, created by setting the camera to a long shutter speed and running around in front of it with Joe’s LED head torch. Bing’s daughter paints a sparkler picture. You can’t see me; I was moving too fast to be visible in the long exposure. But I was there, running around like a dervish with my flashlight. I’m not sure why my torso has an empty rectangle inside it. Thanks to Jerome for painting the “bars” behind Joe. It took me a few hours to thaw out when we got home, but it was worth it. After all these years, I was able to prove my third-grade art teacher wrong. I don’t stink at painting after all. Quintessential Joburg: Creativity mixed with urban decay. Past mixed with present. Darkness mixed with light. Brilliant, Heather! 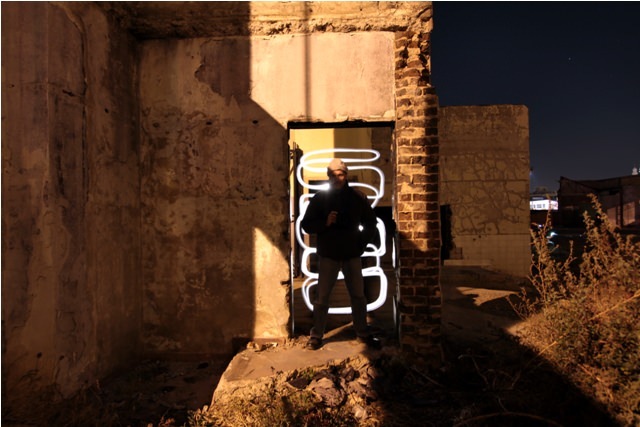 I totally love, love, love these photos–especially the light tracing the graffiti! Thanks Kathy, that’s my favorite one too. Nice post and thanks for the link! Interesting that it was a bus depot, right next to the old Bus Factory. Yes, I guess that would make sense. Joe wasn’t 100% sure though – maybe someone else can confirm. Great Heather, yet again. Is that me in that last photo? Hmm, I don’t know! It was taken near the beginning of the night, in the space near to the entrance by the highway overpass. Oh my word! I love it. We’ll definitely join you on the next excursion. Can’t wait to be back in crazy/beautiful Jozi. Yes! 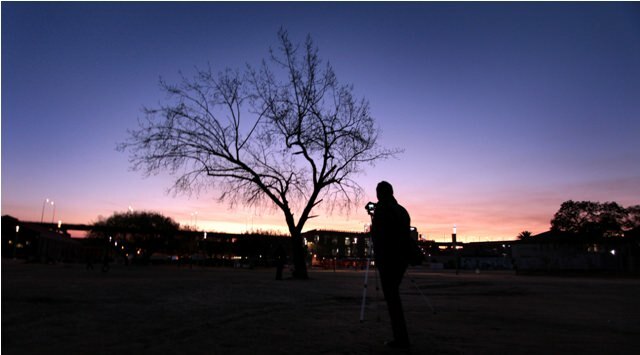 You’ll love the photowalks. Fantastic! You’ve made a great leap! Pow! 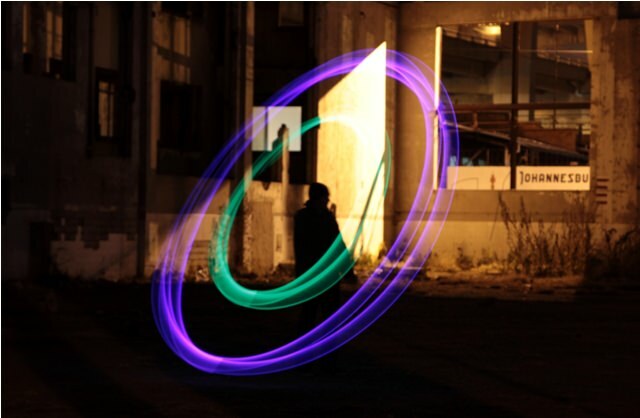 What great fun is light painting! The old industrial buildings are perfect for it. There was also the city tram depot there, all those old buildings formed the nucleus of the old municipal services hub. Check the cement logo/badges over the main entrances, The city power offices are still right up against the double decker bridge, nice old deco building. There is still an oil powered electricity generator further down near bottom of Fordsburg. Wow, Heather! These are really cool! When I grow up I definitely want to try this at home 😉 Thanks for sharing the fun. It’s really fun and not that hard! Just need the right equipment.